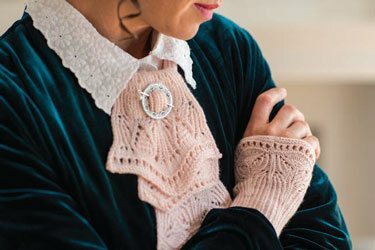 This beautiful knit cuffs and jabot set is inspired by tea time attire in Downton Abbey. The jabot may be worn with the ruffle filling in close to the neck, using a pretty shawl pin. Details include the clean lines achieved using twisted stitches juxtaposed with the delicate beads and curves achieved using lace techniques.